PECAN PIE MARTINI - A Nut Cocktail that you'll go nuts for! Got a sweet tooth? Adore nuts? 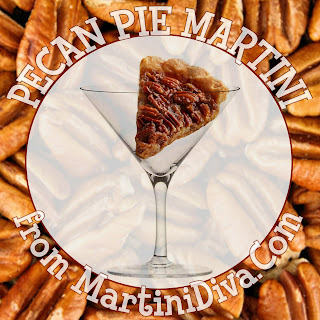 If you do then you'll love my Pecan Pie Martini recipe. It has all the same ingredients as a pecan pie except the crust! You get that rich, deep caramel flavor of the pecan pie filling with the use of dark corn syrup and vanilla combined with your vodka and the maple - pecan nut rim brings it home. Ingredients: 2 Oz. Pinnacle Pecan Pie Vodka 1 Oz. Butterscotch Schnapps 1 Oz. Half & Half 2 Dashes Chocolate Bitters 1 Pinch Sea Salt 1 C. Ice Garnish: Crushed Pecan Rim Directions: Dip glass rim in some of the butterscotch schnapps and then into the crushed pecans. Chill glass in freezer. Combine the ingredients in a cocktail shaker and shake until well chilled. Strain into the chilled glass and serve. Pecan Pie is a classic southern dessert said to have originated when the French migrated to New Orleans and were introduced to nuts by the native population, though the Karo Syrup company claims it created pecan pie as a way to use it's syrup. The first record of a pecan pie recipe was in 1925 though it didn't show up in recipe books until the 1940s. I hope it doesn't need to be said that if you have nut allergies you don't try this martini? If you don't have a nut allergy than go nuts and enjoy!